Among proponents of devolution as a means of power-sharing in Sri Lanka, one of the key bones of contention about the Thirteenth Amendment has been the Concurrent List. This is the list of competences, or ‘subjects’ as they are called in the constitution, over which powers are shared between the central government and the Provincial Councils. This list is part of the broader distribution of powers and functions that are arranged in three lists in the Thirteenth Amendment, the other two being the Reserved List and the Provincial Council List. This tripartite arrangement was no doubt influenced by the Indian constitution, which was the sole comparative referent during the drafting of the scheme of devolution in 1987. The significant difference of course was that devolution in Sri Lanka was intended to function within the hierarchy of norms and institutions dictated by the foundational constitutional concept of the Sri Lankan republic, the unitary state, whereas the Indian system operates according to a federal logic. In the years since, the manner in which the Thirteenth Amendment was implemented, or more accurately, improperly and incompletely implemented, led devolutionists to identify a range of design defects in this framework. These included the powers and functions of the provincial governor, the fiscal and financial framework, the ‘National Policy’ clause, and the Concurrent List. These criticisms, which were and are legitimate in the context of the reluctant and parsimonious way in which successive Sri Lankan governments, and it might be added, the higher bureaucracy and judiciary, have approached devolution, added to the rejection of the Thirteenth Amendment by Tamil nationalist parties on other more fundamental political grounds. Eminent constitutional lawyers like the late Dr Neelan Tiruchelvam and Dr Jayampathy Wickramaratne, and other experts associated with the Majority Report of the APRC’s experts’ panel, have all reflected the position that the Concurrent List is a major impediment to devolution. constitutional politics involved in the TNA’s potential participation in the Parliamentary Select Committee proposed by the President, D.B.S. Jeyaraj has recently argued for the removal of the Concurrent List as a core requirement of that process. I have long felt, however, that these wholly valid criticisms of (a) the particular design of the Concurrent List in the Thirteenth Amendment, and (b) the numerous examples of the way in which the Concurrent List has been abused by the central government so as to denude provincial autonomy, do not add up to a persuasive case for the wholesale removal of the concept of concurrency itself from our constitution and system of devolution. Thus while I agree with the criticisms of the Thirteenth Amendment’s Concurrent List, I believe that responding to the resulting need for reform by abolishing the principle of concurrency itself is akin to using a sledgehammer to crack a nut. This position derives from a conceptual understanding of concurrency as an important element of constitutional interdependence within a devolved polity, as well as constitutional democracy more generally. I will elaborate on this in a moment, but first we need to understand the specific character of concurrent powers as established in the Thirteenth Amendment. The Concurrent List (List III) enumerates 36 subjects, with some items further elaborated in sub-items. It includes planning (Item 1), education, educational services and higher education (Items 2, 3 and 4, except to the extent specified in Items 3 and 4 of List I), housing and construction (Item 5), acquisition and requisitioning of property (Item 6), social services and rehabilitation (Item 7), agricultural and agrarian services (Item 8), health (Item 9), co-operatives (Item 15), irrigation (Item 17), fisheries within territorial waters (Item 19), tourism (Item 22), food and drug standards (Items 30 and 31), and prevention of infectious diseases (Item 35). From the perspective of constitutional design, it is quite easy to see why these policy areas have been demarcated as concurrent competences: infectious diseases, for example, do not recognise provincial boundaries and it is necessary therefore that governmental responses to them are co-ordinated between both central and provincial levels. And from the perspective of effective devolution and provincial autonomy, it is better that the constitutional framework designates these areas as concurrent jurisdictions, forcing central and provincial levels to work together (at least notionally), rather than vesting the subject entirely in one level or the other. The latter approach almost always favours centralisation rather than provincial autonomy. The concept of concurrency in the Thirteenth Amendment is one of ‘central field pre-emption’. That is, central legislation over concurrent subjects prevails over provincial statutes when Parliament unilaterally deems it so. It is this unilateral power of override given to Parliament that attracts the criticism that concurrent powers are nothing more than an extension of the powers of the central government to the disadvantage of the provinces. While this is true, as the reasoning of the Supreme Court in the In re the Thirteenth Amendment case (1987) indicates, it is difficult to see how devolution can be made to fit within the overarching constraints of the unitary state and specific constitutional provisions (some of them entrenched) that give effect to it, without providing Parliament with such a power. This of course opens up the biggest constitutional issue there is in post-war Sri Lanka: the question of the future of the unitary state. The Thirteenth Amendment probably reflects the maximum extent of provincial devolution that is theoretically possible within the particular conception of the unitary state that is enshrined in the present constitution, and even this is arguable when Justice Wanasundera’s powerful dissent in In re the Thirteenth Amendment is taken into account. Thus any serious traversal down the path of ‘Thirteenth Amendment Plus,’ to the extent it denotes an enhancement of the powers of Provincial Councils, would seem to require substantive changes to the unitary state, even if purely formally or symbolically it retains its place upon the constitutional text. If on the other hand Thirteenth Amendment Plus merely means the addition of a second chamber to the central legislature while retaining the existing or reduced range of provincial powers (i.e., minus police and state land powers), then a different set of political and legal questions arise. These are all interesting constitutional conundrums, but they must await discussion on another day. I am here only concerned with the more specific question about whether the solution to the problems of the Thirteenth Amendment’s Concurrent List lies in the abolition of concurrency, or in its reform. Under the Thirteenth Amendment, both Parliament and Provincial Councils are empowered to legislate in respect of concurrent subjects. Provincial Council statutes on concurrent subjects may prevail over pre-existing central legislation, but Parliament can by resolution override the application of such statutes. Any future central legislation on a concurrent subject has pre-eminence over a provincial statute. This is obviously an extremely vulnerable framework that renders the notion of ‘concurrent’ competence virtually meaningless by allowing Parliament to legislate over Provinces at will. Even the weak safeguard in Article 154G (5) (a) that Parliament should consult Provincial Councils before legislating on the Concurrent List has almost entirely been observed in the breach. It is for these reasons that devolutionists feel that the Concurrent List should be abolished. However, to reiterate the point made at the beginning: while criticisms of the particular design of concurrent powers as reflected in the Thirteenth Amendment are valid, it does not follow that the concept of concurrency itself is something that is necessarily contrary to devolution. Neither does it necessarily follow that the solution to this problem is a system of exclusive competences, which presages competition rather than co-operation between the central and provincial levels. It is likely that institutionalising such a competitive logic in the devolution framework would ultimately work in favour of the (by definition) more powerful central government, thereby frustrating the very provincial autonomy that devolutionists seek to protect. The question of pre-eminence in the concurrent field need not be resolved by constitutionally privileging legislation of one or other tier of government, as in the case of the Thirteenth Amendment, where central legislation has automatic pre-eminence over provincial statutes. A genuine framework of real concurrence or shared competence would be one which enables decisions on which tier should prevail to be made on a case by case basis, by reference to democratically legitimate and constitutionally established principles such as subsidiarity, effectiveness, efficiency and so on. The example of education policy serves to illustrate how a sophisticated use of concurrency in a devolved system can help promote not only provincial autonomy together with state-wide co-operation, but also more generally enhance the quality of democratic government. If we take secondary education as a policy concern in a democratic society, we see that policy-making must reconcile several layers of competing interests. Local government authorities, the level of government closest to the public, have an interest in the location of schools due to implications they have for local services. The provincial level may have another set of interests in secondary education such as the promotion of a regional language and culture. The central government has the responsibility for the protection of a further set of interests, including the assurance of state-wide educational standards and the regulation of examinations and qualifications. Seen this way, it becomes clear that policy formulation, legislation and executive implementation in regard to secondary education could be undertaken with optimum delivery on democratic expectations if institutions are designed not only to ensure representation for these multiple interests, but also to ensure that they work together. 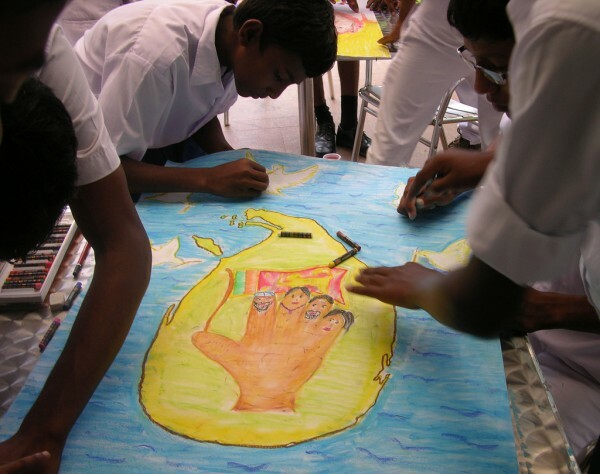 Locating secondary education in a well-designed field of concurrent jurisdiction therefore commends itself over exclusively privileging one tier of government, as the means by which participatory and representative democracy can be maximised. From the viewpoint of democratic government, such a system seems to be preferable to both the over-centralisation that we see in Sri Lanka today (in which it is assumed, despite clear evidence to the contrary, that only the central government is capable of efficient delivery) or a system of exclusive competences. Obviously, not all policy areas need to be located and regulated within a field of concurrency. Large areas of policy would still belong within exclusive provincial or central competence. But this brief example I hope serves to demonstrate the general utility of the concept of concurrency, over and beyond the specific defects of the Concurrent List in the Thirteenth Amendment. Even if concurrent powers are not designed by reference to a federal logic that presumes a co-equality of central and provincial institutions, it is possible to build in better safeguards for provincial autonomy. Such safeguards maybe both substantive and procedural, as well as institutional. Thus there needs to a better and clearer articulation of concurrent responsibilities in the constitutional text, which would minimise the opportunities for encroachment. There needs to be a more balanced method of determining pre-eminence within the concurrent field, by reference to clearly articulated principles such as subsidiarity and co-operation, rather than blunt assertions of central supremacy or provincial exceptionalism. Institutional safeguards could include formalised roles for the provincial level in central legislative and policy-making processes such as through a second chamber, and in the executive through inter-ministerial councils. All multi-level systems, whether devolved unitary states or federal states, reflect a particular institutional configuration between self-rule at the periphery and shared-rule at the centre that answers to specific democratic requirements of each society. In post-war Sri Lanka, the central compulsion and requisite of constitutional reform is to discover this elusive balance, both with regard to the meta-constitutional norms of democracy and power-sharing as well as the particular forms and structures through which we give effect to them. While greater provincial autonomy is clearly needed, and over-centralisation drastically reduced, we should not lose sight of the shared-rule dimension in envisioning a future constitutional order that unites the peoples of Sri Lanka while guaranteeing their autonomy. Many may feel that this is an esoteric debate, and some may feel that the emphasis is misplaced, to the extent that the key focus of moderates, progressives and liberals in the context of the post-Eighteenth Amendment constitution and the problem of hyper-centralisation, should be stronger provincial autonomy. In this view, the democracy rationale only adds impetus to the older power-sharing imperative in the advocacy of greater devolution. I agree, but as I have argued, the debate about the forms and extent of stronger provincial autonomy cannot, and should not be conducted without regard to the way shared institutions are designed to function. In this regard, in addition to other devices such as a second chamber, I strongly believe that the retention of a field of concurrent jurisdiction – understood as both a key organising principle of a devolved polity and as a norm of constitutional democracy – is particularly desirable. The concept of concurrency supports a co-operative rather than a competitive culture of multi-level governance. Its removal to make way for an exclusive division of subjects between the centre and the provinces may not necessarily ensure the desired protection of provincial autonomy. On the contrary, given the zero-sum nature of our political culture, an exclusive division of powers may well serve to institutionalise a deleterious culture of antagonism between different tiers of government, a tendency to which the crucial relationship between the Tamil-speaking provinces and the central government is especially vulnerable. The resulting constitutional deadlock and failure would be disastrous for our post-war society. In redressing the problems encountered with the Thirteenth Amendment’s Concurrent List, therefore, we should be careful to avoid throwing the baby out with the bathwater, or if preferred, the champagne out with the cork. A toast then (Dom Perignon of course), to Welikala’s essay! This is not only one of the best, but one of the most important interventions in the Sri Lankan policy debate that I have read in recent years. There is no higher compliment I can pay than to observe that Asanga’s analytical essay and its argument constitute the only feasible formula for the negotiated settlement of Sri Lanka’s ethnonational Question, certainly at this (postwar) stage of history. Asanga has homed in on and demarcated the only subject area that can and must be negotiated today. This is what the talks must be about and agreement can be about, and it always was for the last quarter century. The failure to grasp this was a cause of considerable bloodhsed and horror. It must not be repeated. I urge the translation of Asanga’s essay into Sinhala and Tamil and its widest possible publication in the mainstream media. Even more pressingly, it should be circulated as its stands, to all MPs, especially those who may participate in the Parliamentary Select Committee. Asanga Welikala has made a good case for revisiting issues relating to devolution and power sharing with an open mind by those representing the majority and minority communities in Sri Lanka. We have been taught many lessons by our post-independence history, but we are adamant that we will not learn our lessons. What is good for Sri Lanka as a nation should be the prime consideration. Should Sri Lanka be looked at as a nation of citizens or as a nation with diverse communities, with the Sinhalese being the overwhelming majority? Do the minorities need protection because the Sinhalese are the overwhelming majority? Should all citizens be equal in law and in fact, irrespective of their communal linkages? Do the minorities need communal enclaves to ensure their protection and survival? How could the minority identities be protected and treasured as an important part of our national mosaic? These are the questions that need to be addressed seriously. May 18th/19th’09 should be a watershed in our history. The time is ripe for us to revisit our post-independence history and see where and why we have gone wrong. What is wrong with our present constitution and those that preceded it? What can we learn from other nations and their constitutional arrangements? If the present republican constitution is part of our political evolution, how can we correct it to become wholesome, balanced, accountable and more effective? How can we ensure greater checks and balances in our constitution? The 13th amendment is not sacrosanct. However, the reasons and circumstances why it became part of our constitution are sacrosanct. The 13th amendment may be the dirty bathwater, while the reason it became necessary is the baby. Do we need fresh and clean bath water, or continue to use the contaminated water and pretend it is good for the baby? Should the dirty bath water be filtered or be replaced? Do we need palliatives or drastic surgery? Can we address our problems honestly and sincerely? Should there be a mechanism working in parallel with the Parliamentary select Committee (PSC), such as a ‘ Constitutional Commission’ of eminent men and women, to make recommendations to the PSC. Should constitution making or re-making be left to the politicians alone? Are our politicians capable of becoming the ‘Founding fathers and mothers’ of a resurgent, modern, progressive, humane, scrupulously fair and compassionate Sri Lanka? Should we rely on the politicians to correct their mistakes and get rid of a system they have designed to serve their own ends? Can our politicians become statesmen/women? How can we redesign our constitution to transcend petty politics? Should we make constitutions/laws to serve our current sort-term interests or to serve our long terms interest as one nation? In fact we don’t need your “greater provincial autonomy” for our people. However, we need our island back. Don’t worry wije. 13A is already dumped under the mythical 13+. This is what i have been always saying,first give it a chance to work,and then point out the defects.In otherwords put the horse before the cart and not the other way around.We put the cart before the horse and then we say the cart is not moving.Pillayan complained that he has been given a car and not the keys to drive it.If you don’t drive it how will you know what its defects are? If the answer is no,then can we first implement it properly and completely before complaining about it.Once we have done that we can take valid complaints to the indian manufacturer and ask them to fix it,this time without dixit. Everything achieved in life is a step by step process.If you try to climb the 3rd step,bypassing step 1 and 2,then you fill stumble and fall.Haste makes waste they say.Reconciliation is a step by step process and will take a long time to achieve.The direction we take is more important than the speed.The indo lanka accord sets us in the right direction,which is devolution,instead of centralised control.